We have come to expect Eddie’s talks to be well-researched, thorough, and challenging. This talk didn’t disappoint. 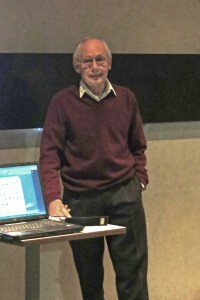 As Eddie said in his introduction, this was not a talk about astronomy, it was about optics, and Eddie was on home ground – much of his professional career was in the field of optics. And 2015 has been designated as UNESCO’s International Year of Light – very appropriate. In the beginning there was Newton. In his seminal work on the spectrum of sunlight, Isaac convinced himself that the colour fringe around an image cast by a simple lens (chromatic aberration) would make lenses unsuitable for use in telescopes because the image appears fuzzy. Mirrors don’t have this problem and in 1669 Newton’s answer had been to design and make a telescope using a mirror. Now known as a Newtonian Reflector, his telescope was very well received by the Royal Society and he became a determined advocate of reflectors. His pronouncements dominated thinking in England. In Opticks (1704) Newton described experiments to show that chromatic aberration could never be entirely eliminated from a system of lenses. This is wrong and Eddie argued convincingly that Newton’s experimental approach was less than sound – maybe he saw what he wanted to see and even cut some corners. Not everyone was convinced. In the 1730s an amateur, Chester Moore Hall, picked up on suggestions that the human eye didn’t suffer from the problem (actually it does, but never mind) and experimented with doublet combinations of two lenses made of different kinds of glass. He found this could mitigate the problem. His work came accidentally to the notice of an optician, George Bass (of whom more later). Enter John Dollond. In 1752 he gave up silk weaving and joined his son Peter in a business making optical instruments. Dollond came to doubt Newton’s conclusions and carefully repeated his experiments. During this time he visited George Bass and could have heard from him about the work 25 years earlier by Moore Hall. Dollond demonstrated that chromatic aberration could be significantly reduced by using a doublet combination of lenses. In 1758 his paper on the subject was read to the Royal Society and received great acclaim. He was awarded the Copley Medal, the Royal’s highest award, and in the same year was granted a patent. After John Dollond died in 1761 his son Peter moved to enforce the patent. His competitors put a petition before the Privy Council to have the patent revoked on the grounds that George Bass had made such lenses before 1758 and Dollond got the idea from him. The Court upheld Dollond’s patent, ruling that “it was not the person who locked his invention in his scrutoire that ought to profit by a patent for such invention, but he who brought it forth for the benefit of the public”. Dollond’s company thrived and its instruments were highly prized by astronomers and naval officers during the Napoleonic Wars. All was rosy in the Dollond garden until about 1814. Then in Bavaria, Joseph Fraunhofer worked very methodically to measure the optical characteristics of different types of glass. He designed a high-resolution spectrometer and discovered 574 dark ‘absorption’ lines in the solar spectrum. These provided the basis of a quantitative understanding of the spectrum and properties of glasses. They also opened up a whole new field of astronomy, ’spectroscopy’, kick-starting astrophysics and introducing us to the now well-known property of spectra from distant galaxies – ‘redshift’. In around 1820 a Swiss, Pierre Guinand, working in Fraunhofer’s company, devised a way of making much larger glass blanks than previously possible. This opened the way to the great refracting telescopes later in the century. The world centre of optical work had shifted to Germany. Developments by Ernst Abbe in the 1870s and Otto Schott in the ‘70s and ‘80s moved knowledge and techniques forward and made German optics preeminent. By the time of the First World War the quality of German optical instruments was a significant advantage for the German Navy and Army and Britain was playing catch-up. Eddie’s talk was lavishly illustrated with detailed diagrams and graphs, and as usual he made us concentrate! The talk was followed by a lively Q&A. At one point we digressed into the Battle of Jutland and the role of German optical glass – not astronomy, sure, but entirely appropriate in Greenwich and the National Maritime Museum. Many thanks to Eddie for sharing his insights.